TLDR: The first of two Pacific storms is upon us and has dropped a decent amount of valley rain and mountain snow here in northern Utah, with more on the way. A second storm will pass through our region beginning Saturday evening, bringing in another chance for significant snow in the mountains. Snow has fallen once again in our beautiful Utah mountains after what seemed like a LIFETIME of the hot sun beating down on them, melting away quite a bit of a still-solid base depths. Snow totals across the area have been modest with Alta and Snowbird reporting ~4″, and everyone else a big goose egg. Snow should pick up around 8PM tonight, however, with more valley rain and mountain snow. Bases of ski locations above ~6,500 ft should receive all snow (albeit very wet) as freezing levels will be around 7,500 ft and wet bulb zero temperatures will be ~6,600 ft.
As the upper-level trough currently affecting our region slowly moves eastward, expect synoptic scale lift to continue providing valley rain/mountain snow showers across Utah. Ridging eventually will dry us out and put an end to showers by late Friday evening. Snow totals tomorrow look to be modest again, generally 2-4″ across the board in higher terrain. Take a look at the HRRR forecast precipitation type radar from today through Friday evening. Ridging will continue through the day on Saturday until the early evening with light snow showers beginning as our second Pacific storm moves in. 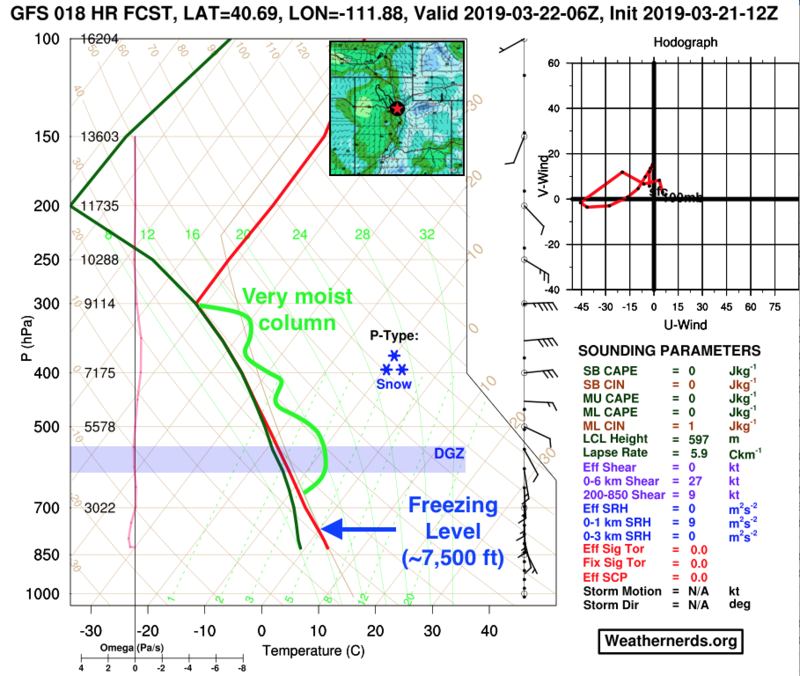 At this point, it appears that there will be quite a bit of difference aloft, so some precipitation could be of the convective type. 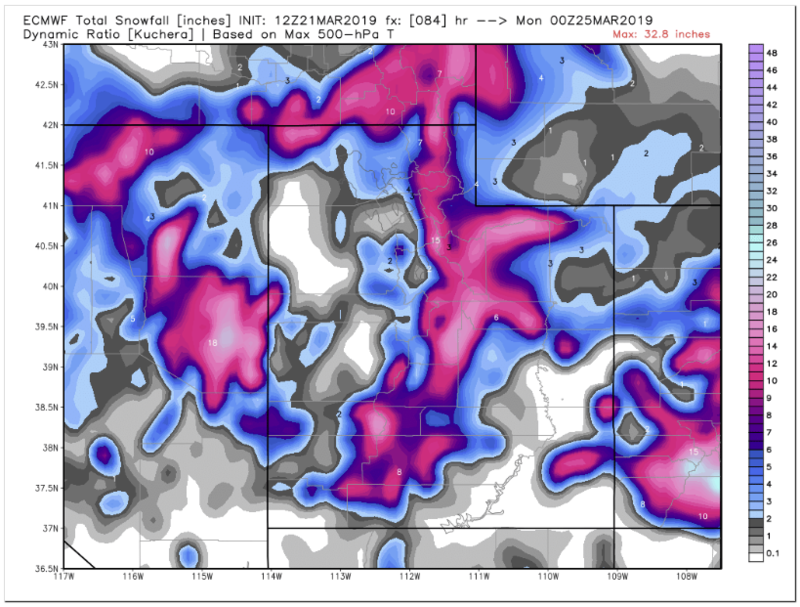 As of today’s 12Z ECMWF (Euro model), the forecast it for a combined 15″ of snow for the Cottonwoods from now through Sunday evening. We’ll see how it shakes out! In general, the pattern going forward looks to be quite moist. The GFS precipitable water (PWAT) forecast indicates that an “atmospheric river” could persist over the region for quite some time (at least a week). With the global models forecasting an overall “troughy” pattern for us, that means we might have the potential for some interesting winter storms yet before some of the ski locations start to close! Enjoy the new snow, and good luck to all of your NCAA brackets!